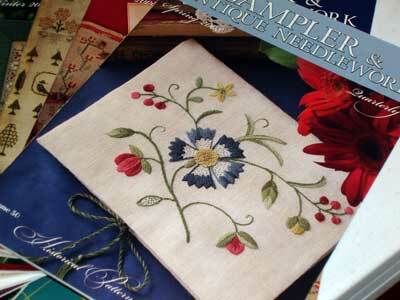 Nice Magazine for Historical Needlework Buffs – and Everyone Else, Too! 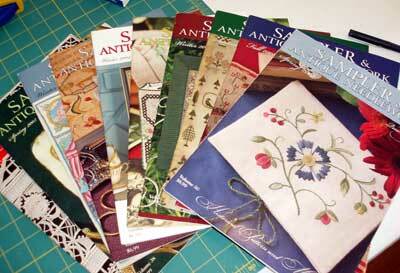 Are you familiar with the magazine Sampler & Antique Needlework? It comes out five times a year – quarterly, plus one special holiday edition. 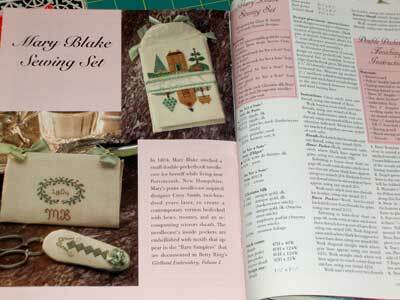 The magazine is devoted, firstly, to historical samplers of a variety of types. Within its pages, you’ll also find lots of informative articles, pictures, and insights to embroidery tools and techniques, and to the needlework trade in general throughout history. I just recently began subscribing to the Sampler & Antique Needlework, because I was enchanted by an article I saw in a friend’s copy. The article was about a specific historical sampler worked by a seven-year-old. The sampler was beautiful, and it amazed and inspired me that it was worked by a child seven years old! Wow! 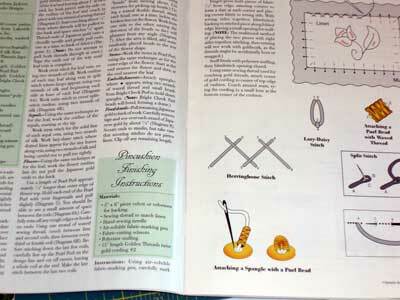 Flipping through the copy of the magazine, I found many interesting articles to read, some neat facts about different needlework tools, and plenty of patterns to recreate various historical pieces or try various techniques. When I had the opportunity, I looked the magazine up and found that I could order a slew of back issues, too. In fact, Wyndham Needleworks carries many back issues and they detail on their website the contents of each issue – a very handy reference, if you have something specific you’re looking for! 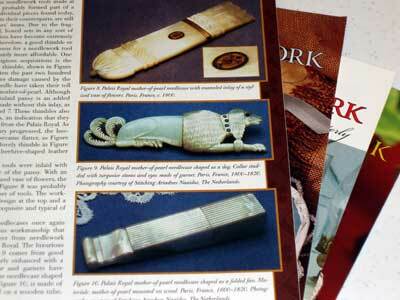 It’s a goodly little stack of interesting and valuable needlework information! What I particularly like about the magazine is that it focuses on a variety of needlework techniques and samplers, beyond simply the “ABC” style samplers that we tend to associate with the word “sampler.” That’s not to say there aren’t plenty of those, too, as there are – and I find them fascinating. Looking at them is like looking at a little clip of a needleworker’s life long ago. I love that! 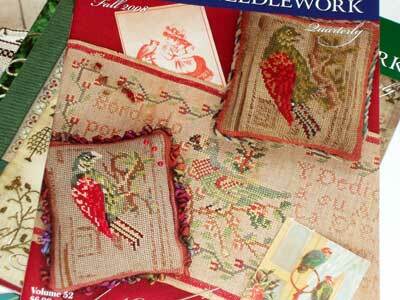 Some issues of the magazine focus on a theme, such as the issue above, which explored birds in antique needlework. I’m a bit of a bird lover myself, so this issue was really fascinating for me. The focal point of this issue is the sampler featured on the cover. Inside, you’ll find the chart to recreate the sampler. You’ll also find all kinds of information about this historical piece, from its creator to its conservation. 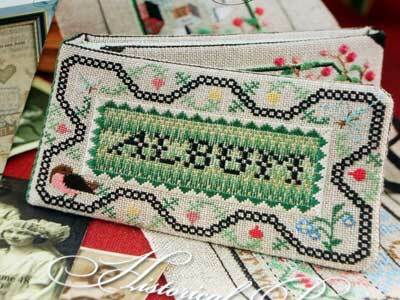 All types of historical needlework find voice in Sampler & Antique Needlework – including beadwork! … and this fantastic piece of needle lace! Wow! The inside of the magazine is nicely laid out, which beautiful pictures, plentiful articles, and clear instructions for the projects featured within the issue. In some cases, the instructions are drawn diagrams; in other cases, they’re photos. Above in a section of instruction on the stumpwork sampler. 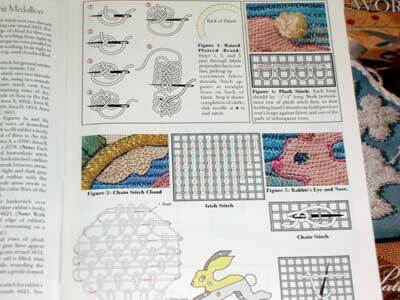 You’ll probably recognize the plaited braid instructions, and you can also see detached stitches and stitch direction and color change being demonstrated. 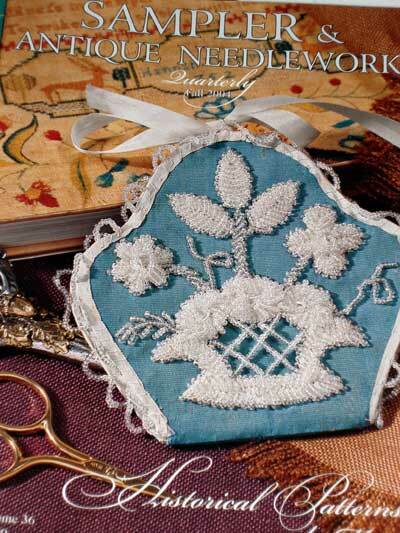 The articles on historical pieces, needlework tools, and so forth are scholarly and well-written, with citation of sources and insights from experts in the field of needlework and in other related fields. Clear and close-up photos abound! I wanted to introduce you to this magazine, if you weren’t already aware of its existence, in case you might find it as interesting as I do. I’ve subscribed to several needlework magazines over the years: Inspirations, which is the nonpareil of needlework magazines as far as projects, quality, & aesthetic appeal are concerned; Australian Smocking & Embroidery; Piecework; Stitch; Classic Stitches; Threads; Embroidery & Cross Stitch; and a variety of others. The only subscription that I have consistently kept is Inspirations. 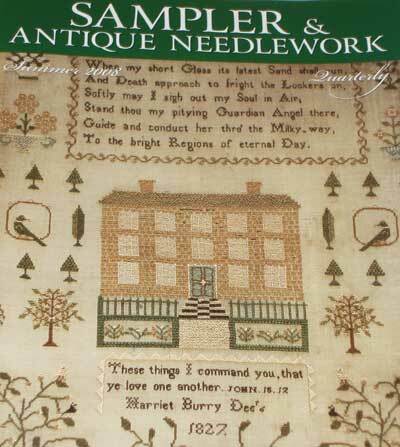 Content and quality-wise (for my interests, anyway), as long as Sampler & Antique Needlework maintains its present quality, it’ll definitely be a magazine to which I consistently subscribe. 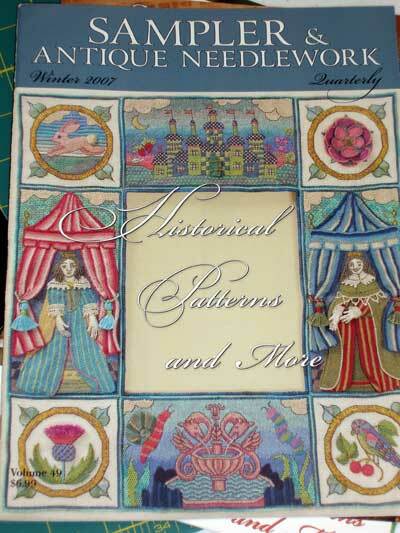 Note: For those who might become twitterpated with any particular cover project featured above – for example, the stumpwork project – keep in mind that some larger projects (like the stumpwork one) are serial features in several issues, so you might want to check the contents of each issue before ordering back issues. July 30, 2010 SPOOL! Look What’s Coming! I love that goldwork piece! Hm… I just bought some silk yesterday and was wondering what I should do with it… I’m going to get in so much trouble with my husband! oooh boy, something else for me to covet!! I like this magazine, too. I have a few copies, but have resisted subscribing due to space issues. I have enough problems finding places to store ‘Inspirations’! I think they have a good selection of techniques, projects and articles. I recently completed the stitching part of the crewel project (second photo). It was a good way to try out Heathway crewel yarns. (I like them, by the way.) I haven’t decided yet whether or not I’m going to do the finishing. I love this magazine. I have been collecting them for years, and have all the back issues. I am in the process of getting a fiance VISA to marry a US citizen, and last time I went there (i`m in Canada now) I took most of my needlework supplies, as I stayed 6 months. I didn`t put my issues of SANQ in my luggage, afraid they would get lost, so I put them all in my carry-on. Boy, was that bag heavy! Glad they didn`t weigh it.I had to get a male passenger to put it in and out of the overhead compartment. Anyway, my point is, yes! 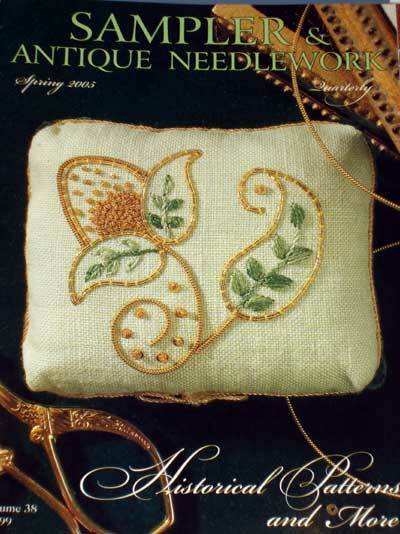 IMO, best needlework magazine EVER! How can i get the back issues and subscribe for the lastest issues of this magazine. Im a diehard fan for these needle works.waiting for the response. You’ll also find both links in the article above, along with some other places that sell the magazine. 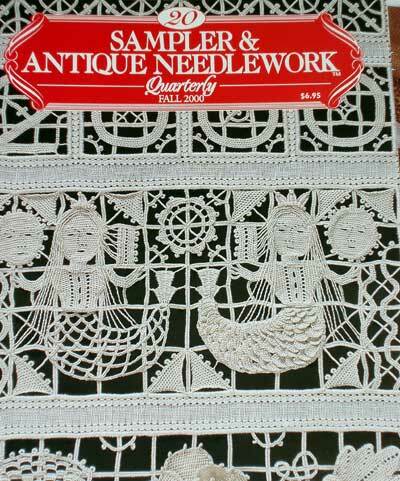 Dear Mary, I have done the needle lace sampler from the issue above “Sampler & Antique needlework” Fall 2000. If you like I could send you a photo of it. Hi, Lynette! I would love to see it!! Previous Previous post: What are Q-Snaps?